This blogpost is still valid however, last week Citrix released NetScaler 10.5 57.7. This firmware release contains various improvements on SSL security. Lets see what has been improved…. First lets try to run a SSL server test on a default SSL based virtual server. Let see how we can get a A+ score with NetScaler 10.5 57.5 on a NetScaler VPX! Before 10.5 57.7 you where only able to create TLS 1.0 virtual servers. TLS 1.1 and TLS 1.2 where not supported on the VPX platform. Citrix now finally made it possible to offload TLS 1.1 and TLS 1.2 traffic on the VPX platform. When you create a virtual server TLS 1.1 and TLS 1.2 are now default enabled. Make sure to disable SSLv3 to prevent POODLE attacks. To get a A+ rating we first need to create a custom Cipher Group which we can assign to the SSL virtual server later. The following list of Ciphers will support all modern browsers and Citrix Receivers. To get a A+ on NetScaler VPX we need to make use of a small set of SSL Ciphers. Therefore we need to create another SSL Cipher Group. Perfect Forward Secrecy protect a session from being decrypted when server key became compromised. To enabled PFS we need to create a Deffie-Hellman (DH) key. As you can see NetScaler 10.5 57.7 is able to get a A+ score. Without any optimization NetScaler scores a C score. With some extra optimisations on supported Ciphers, SSL3, Perfect Forward Secrecy and Strict Transport Security we are able to get this maximum score even on a NetScaler VPX! Last year a lot is changed in the ADC space. Citrix released NetScaler 11 which introduced more new features. At the moment NetScaler 11.0-64.34 is the latest firmware build. This build offers a long waited feature improvement, you can now bind Ciphers to a SSL Profile. 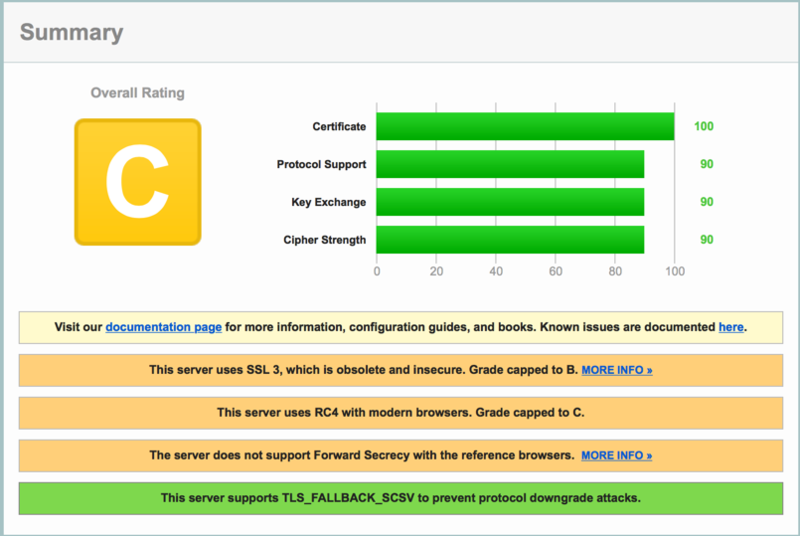 So as mentiond before the SSL Profile forms a great baseline for all your vServers. A SSL Profile can now contain all the SSL related parameters that can be configured per SSL virtual server basis (CS, LB, NSG, AAA vserver). As soon as you bind a SSL Profile to a virtual server this will override the individual SSL Parameters, and also the SSL Ciphers. Frontend Profile: To be used with a virtual server and manipulate the client connection. Backend Profile: To be used with a service or service group to manipulate the backend connection. Note that i’ve enabled SNI in this profile to make use of multiple server certificates per virtual servers. If you only have a single wildcard or SAN certficate per virtual server you don’t need to have the SNI feature enabled. I’ve also changed the Deny SSL renegotation feature setting in this SSL Profile. I will dive into this later. After we’ve created the SSL Profile we now can bind the SSL Ciphers to the SSL Profile. Note that you can’t bind a custom Cipher Group. You will need to bind the indiviual Ciphers to the SSL Profile, or use CLI if you want to bind your custom Cipher Group to the SSL Profile. At the moment 02/22/2016 the following Cipher list is compatible with NetScaler and gives a A+ rating at SSL Labs. After we’ve created the SSL Profile including the Ciphers we first have to enable the default SSL Profile feature which automatically will bind the built-in SSL Profile to your virtual servers and backend services!! Note that the default SSL Profile is now bind to your virtual server! Also to get a A+ rating on SSL Labs a few settings has changed. If you have the right Ciphers in place you do not have to configure Perfect Forward Secrecy manually via the Deffie-Hellman (DH) key anymore. Without the Deffie-Hellman (DH) key specified you will also get a A+ rating. Needless to say that if you do configure Perfect Forward Secrecy you will of course be more inline with the most secure SSL rules. Are you using 10.5 57.7? Did you create the DH key and bind it to the Virtual Server? Try to rearrange the cipher suites. Add the strongest first. Excellent blog post! I was able to get an A+ rating! Selecting all default HIGH ciphers fixed this issue. Thanks for the update Arno! Have you recently updated the Citrix Receiver? Or using IE8 on Windows XP? Maybe your cipher list is specifically for MPX appliances? My website score was A-. I enabled DH Param as you suggested and the score dropped to F!!! Any idea why such a drop? Are you using a SHA-2 server certificate? I am experiencing the same issue. When enabling the DH Param, score drops to F and without it I get A- and complaint that perfect forward secrecy is not supported. This is on a hardware MPX 7500 netscaler. What ciphergroup are you using? Article updated with a custom Cipher Group for VPX! Don’t forget to bind the ECC curves, too! They *should* be bound by default. However, they are required for PFS w/ ECDHE ciphers. Excellent post! Very easy to follow and made total sense. However, I am stuck on a A- due to server not supporting Forward Secrecy with the reference browsers. I have added the custom cipher group for VPX with no luck. I am running NS10.5 58.11, key is RSA 2048 bits & SHA256withRSA. It was the order of the Ciphers. Please let me know, what order are you using, I configured chipper in below order and the rating is A-. however I have been A+ since this article but now I am A due to a Strict Transport error. I’ve followed the instructions on this page for my VPX 11.0 62.10.nc test setup and unfortunately I’m only getting an A. When I add the VPX cipher group, I get the message: “No usable ciphers configured on the SSL vserver/service” and when I add the ciphers individually I get: “AES-GCM/SHA2 ciphers not supported on VPX and FIPS”. Any ideas of what I might do to improve this? I’m getting the same error here.. Same NS version. This problem does not occur on latest 10.5 version. I flashed it back. Thanks a lot for this useful post Anton. We’ve got a Nestcaler 8400 (ver. 10.5 53.9), we follow all the procedure. Unfortunately we’ve got a “F” ’cause our site seems to be always vulnerable to the Poodle (TLS) (poodle SSLv3 has been patched disabling the SSLv3 protocol). Any ideas? It seems to be very strange…. Thank you for your post, It was very usefull. But in my case I used AAA vserver so I’m not able to bind Rewrite policy for enable the STS. I tried many thing but do you have a solution? or idea? It is possible? The AAA vserver is only used for authentication and authorization, it don’t expose webserver content etc. As soon as you are authenticated against this AAA vserver you will get redirected to the Load Balancing vserver itself, were you can apply the security optimizations! If you have two load balancers that are stand-alone do I need to export the DH key for the 2nd server or can I generate a different key? we’ve got a Netscaler 8400 (ver 11.062) and we follow the procedure that let us get an “A”. in order to get an “A+” we have to implement the STS feature. We followed the procedure, the rewrite policy is matched but we scored an “A” since the STS feature is not seen by the SSLLAB site. the strange thing is that with the old firmware (ver. 10.5 53.9) we scored a “F” but the STS feature was recognized. Do you by any chance have a unified gateway implementation? If that’s the case you will need to add it on two places, the cs vserver and the gateway vserver. Will this work on WinXP with IE8 ? or do you know “best setup” for XP + IE8 ? Is it only me or is TLS1.2 EDCHE Cipher not supported on VPX ? even if I had this with CLI commands it wont be used by the VPX. Just to clarify for everyone. I have noticed on my own VPX (thats not hosted on a SDX). Only TLS1.0 EDCHE Ciphers is supported still on a normal VPX. The only way to get a VPX to support TLS 1.2 is to run it on an SDX and assign it an SSL card. If you are just running a normal VPX on VMWare or XenServer, they do not support anything above TLS 1.0. IF you look at the SSL Parameters tab of an SSL Vserver, TLSv11 and TLSv12 are greyed out. After a lot of testing we found out that there must be a bug (in this Version) using cipher groups. Regardless if we used the gui or the shell we cannot successfully assign the cipher groups to the virtual servers. Cipher on the VPX (the gui tells us, TLS1.2 Ciphers are not supported on VPX). From my point of view that is also a bug in this version, because in general we can enable tls1.2 support on the vServer, but cannot use the tls1.2 cipher?! We are still using a SHA1 Certificate so we received a straight A with this article and the modifications i mentioned. If we would use a SHA2 Certificate we would receive an A+. Thanks for this feedback Dennis! Just tested with NetScaler 11 63.16 and had the same experience. I found that having the escaped quotes in the max-age on the URL rewrite rule caused SSL Labs to return “Invalid HSTS Header” and it didn’t get an A+ at that time. It showed PFS was working but I only received an “A” rating. Prior to doing that I used Fiddler (I didn’t have curl handy) to capture a request from my VPX which showed the quotes, and also a request to ssllabs.com itself, which did not have the quotes. After making that change to the URL rewrite rule I received an A+ grade. Thanks for this Alex, this solved my issue as well (going from A+ to A). Anton, maybe you can correct this in the original article? Thanks for the heads-up guys. This should be a update to the SSL scanners, was working when i wrote this article. However i added a new screenshot with the updated expression. Thanks for the great guide! Also thank you Alex Romp, this caught me out on the latest firmware. Ever look at this site and improve netscalers grade? Mine is a F out of the box. We noted that, while we will get an overall rating of A or above by using your mentioned recommended cipher, the ICA session runs extremely slow. On Citrix Director, we can see the ICA RTT has very high latency, on average around 300-500ms and sometimes even over 1000ms. Wait, you show how to create a custom group for VPX, then your screenshot shows binding the individual ciphers, instead of the group. you keep stating that TLS1.2-ECDHE-RSA-AES-128-SHA256 binds in NS11 on VPX but surely you’re using an SDX for that? Even without the specific Cipher you will get a A or A+ status! will you please give me details configuration with diagram, which help me a lot in future. This removes the first cipher in your list. Before binding a custom cipher group to a vserver, unbind ALL ciphers from the vserver first. This ensures that ciphers will be bound in the optimal order. That last comment was supposed to use code tags, not block quotes – sorry. Wondering if anyone has any insights into ciphers used to back end webservers (your internal network, not visible by Qualys SSL labs)? To my surprise I find that Netscaler firmware v10.5 does not support an encrypted channel to any backend server using a SHA2 ssl certificate. I also get “DH public server param (Ys) reuse	Yes” despite A+ rating. Any solution for this (or at least an explanation)? Hi I get A due the fact that my server provide more than one HSTS header. By browsing my website with the F12 option, i saw two HSTS : Strict-Transport-Security:max-age=300 and Strict-Transport-Security:”max-age=157680000″. I don’t find the one of 300, where can i find it on my NetScaler? When I bind the ECC curves my site become inaccessible from Safari, iPhones and Chrome and IE11. Any ideas what I can do to fix ?